A singer, songwriter and actress, Dolly Parton has enjoyed an incredible amount of success throughout her career and shows no signs of slowing down. She's written over 3,000 songs, sold more than 100 million albums, created a business empire worth more than $200 million, had over 24 Number One hit singles, won seven Grammy awards and eight country music awards. This Tuesday, she released a new CD, "For God And Country," that pays tribute to American troops. 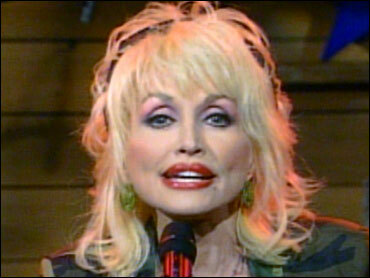 Parton performed her single, "Welcome Home," on The Early Show and told co-anchor Rene Syler, "It's a song I felt inspired to write for our men and women over in the war. That's our first single off of the 'For God And Country' album." Parton describes "For God And Country" as an 18-song patriotic album featuring traditional favorites as well as original compositions. Newly penned songs also include: "Red White and Bluegrass," "I'm Gonna Miss You," "Go To Hell," "Brave Little Soldier," and "Color Me America." Talking about the American soldiers fighting in Iraq, Parton says, "We can't give them enough praise and honor and thanks. I've always wanted to do a patriotic album and nothing could be more perfect than these days." Of her song "Welcome Home" she notes, "I thought a lot of the moms and dads - people would appreciate this particular song because we lose somebody every day and it just breaks your heart. But there are a lot of wonderful uplifting songs in the album, too. They're not all sad. But a lot of them are touching on what we are going through now." The CD also includes "The Lord Is My Shepherd," "The Star-Spangled Banner," "When Johnny Comes Marching Home" and "My Country 'Tis Of Thee." A prolific artist, Parton has written more than 3,000 songs over the years. She gets an idea for a song every day, she says. "I've been playing the guitar and singing when I was about 7, so every day, that's just kind of how I express myself," Parton explains. "I just kind of have a gift of rhyme and stuff starts coming out on my head and why not put it down on paper. I got maybe three good ones out of 3000." Actually, it is not three. She has had 55 Top-Ten country hits and won seven Grammies and eight CMA Awards. Parton says, "I don't work for those. I love doing what I do. I've been so thankful and grateful that I've been able to make a living at something I love to do. I'd do it if I did get nothing for it." Asked if being successful was her childhood dream, Parton says, "I wanted to be. I didn't understand all of the things that it involved, but I wanted to be loved and rich and famous. I wanted to travel. So I really wanted all of the things that's happening to me now. But the older I get, I realize how lucky and fortunate I've been. It was a childhood dream come true and I don't take any of it for granted. It's a joy as well that I love my job."